This week's Isles of Scilly Wildflower Of The Week was Bugloss - Anchusa Arvensis. Bugloss is mostly found on Tresco and St Mary's. It occasionally turns up on the other inhabited islands. It likes light sandy soil and is an arable weed. Take away the flowers and you get a short stiff bristly plant with wavy lanceolate leaves. Add the flowers that have five rounded petals in a lovely blue with white honeyguides and the whole thing perks up no end. I really like the idea that the flowers have honeyguides to let bees and other pollinators know where to find the nectar. The common name Bugloss means ox-tongue from the shape and the texture of the leaves. 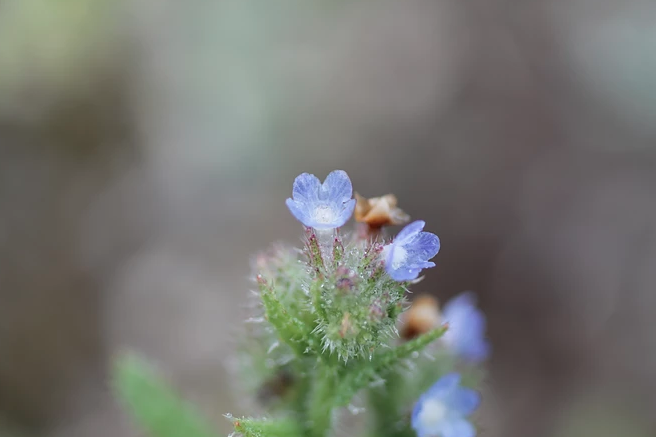 It can be called Small bugloss to distinguish it from Common bugloss. The botanical name, Anchusa Arvensis, means a plant that belongs to the same family as another plant that stains the skin, that grows in fields. There is room for confusion botanically as there are several plants in the Borage family with the name bugloss. This is when the scientific or botanical name comes in handy as it is unique to that species of plant.